It’s plastic, it’s round, it comes in all shades and colours, and there’s more to it than a swing of the hips. Hula-hooping has recently become a popular activity among Haligonians, and at Dalhousie one student is looking to contribute to the movement by creating the Halifax community hoop. 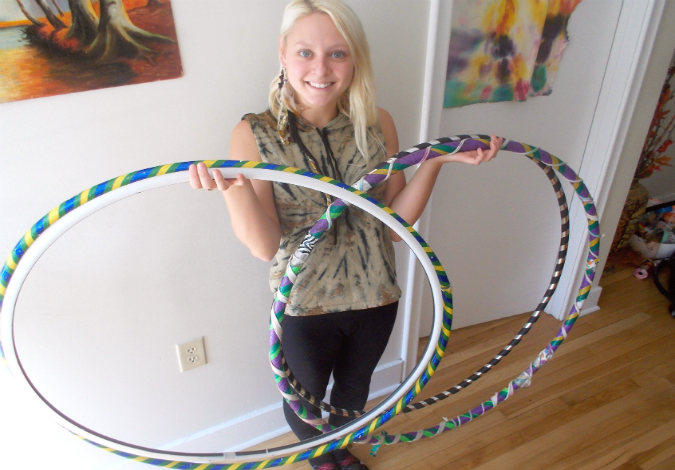 Taylor (Zupiter) Barei, is planning to carry a hula hoop with her every time she goes downtown. She’s made the Halifax community hoop and says it will help to foster a sense of community by getting people experimenting with hooping. “Its all about inclusivity, meeting new people, getting active and building self-esteem,” she says. 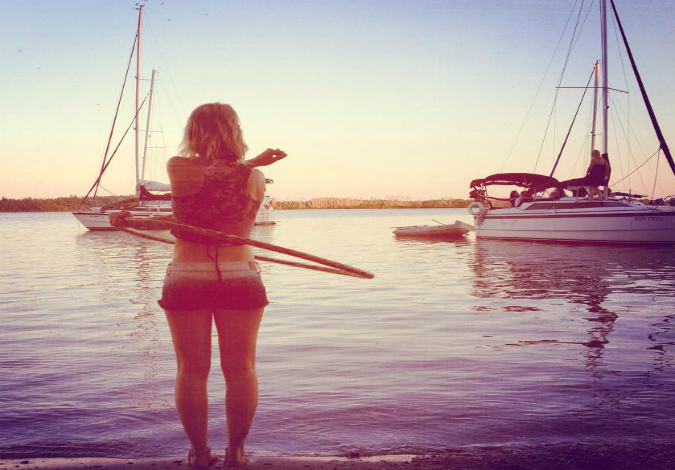 Barei was introduced to hooping three years ago at a music festival, and she’s been hooked ever since. She has been posting hooping videos on Facebook once a week. Before moving to Halifax, Barei attended arts school where she learned modern, jazz and theatre dance. 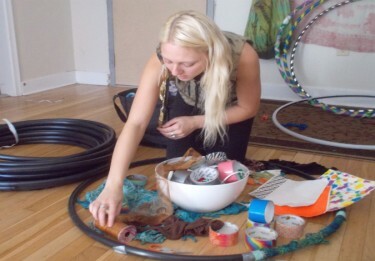 She attended an arts class a few weeks ago at NSCAD University, and while there she realized she needed to fuse her arts background with her hooping activities. Barei says hooping keeps her out of the gym, while remaining physically active. Hula-hooping is a demanding physical activity, and in one class a person can burn an estimated 400 to 600 calories, according to Monique Ryan, co-owner, performer and hula-hoop instructor at Serpentine Studios. Picking up a blue and yellow hula-hoop, Barei swings it around her arm in one fluid motion — a move she calls an isolation. Hula-hooping is a full body workout. “When I tell people I hoop they often think it’s just around the waist. But you can hoop on your shoulders, neck, chest, legs and do countless body tricks,” said Candis Noel Crocket, who’s a self-taught hooper courtesy of YouTube. Barei, a fourth-year sociology and gender and women’s studies student at Dalhousie, has been teaching small groups of people how to make hula hoops out of PVC pipe, connectors and her own used clothing. She pulls out a large white bowl filled with red, silver, rainbow, blue, and army tape — other materials she uses to decorate her hoops. Materials range in price, and 100 feet of PVC pipe can cost up to $40 at Canadian Tire. Specialty tapes cost $10. Using hooping as a way to bring all sorts of people together is what it’s all about, says Barei, who is looking to use her passion for helping people to get her into Dalhousie’s School of Social Work. “It would be a café for people with lower incomes, vulnerable populations, and people with mental illness,” says Barei. In the past, she has been asked to teach hooping and show individuals how to make jewelry at local halfway houses. “It fills their time with something positive,” says Barei. Like any other physical activity, hooping brings its challenges. Having a lack of space to hoop has cost Barei hundreds of dollars in damages from breaking things in her apartment. “Printers, glasses, everything you can think of hoop has destroyed it,” says Barei. Another downside was the physical bruising in the beginning. “I was covered in bruises like my whole chest, my arms and everything. I looked online to see if it was happening to other people and it’s common,” Barei says. Making people happy by hooping is what keeps Barei going, and so far she’s gotten positive feedback on her hoop skills. “The other day I wrote a status saying what are your favorite things about Nova Scotia and someone responded ‘the girl with the hula-hoop’,” she said.